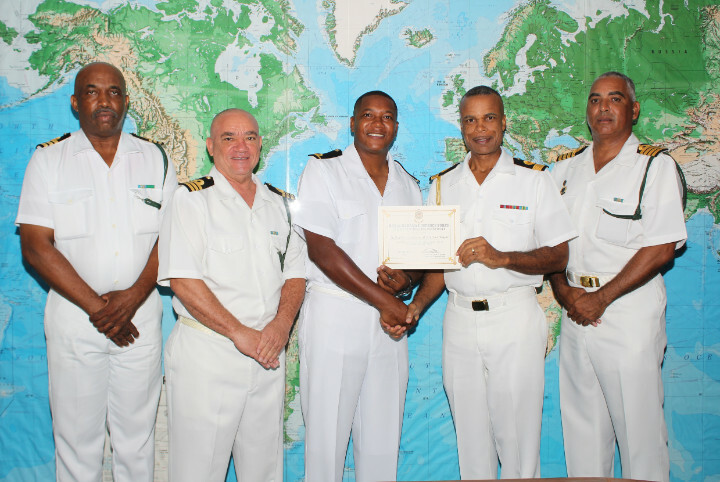 Coral Harbour Base, (RBDF): Commander Defence Force, Commodore Tellis Bethel and the RBDF’S Executive Command team extends Bravo Zulu to Sub Lieutenant Preston Major, who received his Bridgewatch Keeping Certificate. The young Officer, who currently serves on HMBS Rolly Gray as the Navigating Officer, is now officially qualified to be an Officer of the Watch on any Royal Bahamas Defence Force craft. He was presented with his certificate on August 10 at HMBS Coral Harbour by Commodore Bethel, who congratulated Major on his achievement. Sub Lieutenant Major enlisted in the Defence Force in February 2012 as a Marine, and was selected to attend Naval Officer Training in England in May 2015 at Britannia Royal Naval College (BRNC) in Dartmouth, England.